Madge Johnson accepted the award on behalf of Natalie Sourisseau. The Senior Female Player of the Year award is presented to Natalie Sourisseau for 2018. Natalie receives this award as recognition of her commitment and achievement with the Canadian National Team. She was first selected to the Senior National Team in 2011, achieving a near podium performance at that year’s Pan American Games in Rio. A podium finish came quickly thereafter as Natalie helped Team Canada to a bronze medal at the 2013 Pan Am Cup, followed up with a further bronze medal on home soil at the 2015 Pan-American Games. 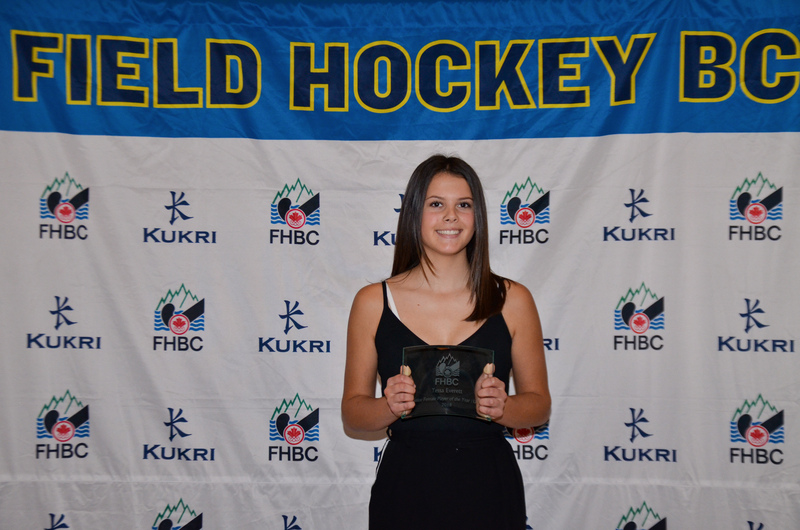 Field Hockey BC is proud to recognise the 127 representative caps Natalie has achieved for Canada to date, and it is Field Hockey BC’s pleasure to name Natalie as the 2018 Senior Female Player of the Year. Regrettably, Natalie was unable to be with us as she is competing in Europe, so Field Hockey BC Vice-President Margaret Johnson accepted the award on her behalf. Taylor Curran, 2018 Senior Male Athlete of the Year. The Senior Male Player of the Year award was presented to Taylor Curran for 2018. Taylor received this award as recognition of his on-going commitment and achievement with the Canadian National Team. We are extremely proud that we can add ‘Olympian’ to Taylor’s achievements, a crowning glory in his field hockey journey to date, a journey with the National Team which began in 2009. Since then Taylor has represented the Canadian National Team in World Cup competition, at the Pan-American Games and at the 2016 Rio Olympic Games. 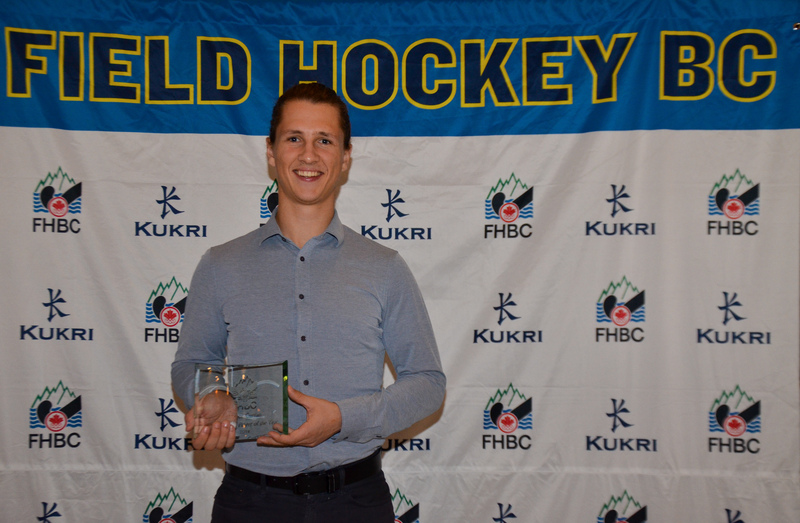 Field Hockey BC is proud to recognise the 147 representative caps Taylor has achieved for Canada to date, and we are pleased to present the 2018 Senior Male Player of the Year award to Taylor Curran. Brenda Rushton (left) accepted the award on behalf of Audrey Sawers; Gurjit Sidhu (right) accepted the award on behalf of Jamie Wallace. Jamie demonstrated great leadership on the pitch and drove the U23 Men’s BC team to the gold medal in the final. His great work rate, ability to influence and decide games, next to his high advanced skills are only some of the outstanding qualities Jamie has to offer. Jamie has been rewarded for all his efforts this past year with selection to the FIH Men’s 2018 World Cup squad. Audrey was an outstanding performer for the U23 Women’s team and her impact during games and in practice was evident. Her effort level and technical ability resulted in her being named to the Field Hockey Canada U23 All-Star team at National Championships in Toronto. Not only that, she has since been rewarded with inclusion in the Field Hockey Canada National NextGen talent identification program. 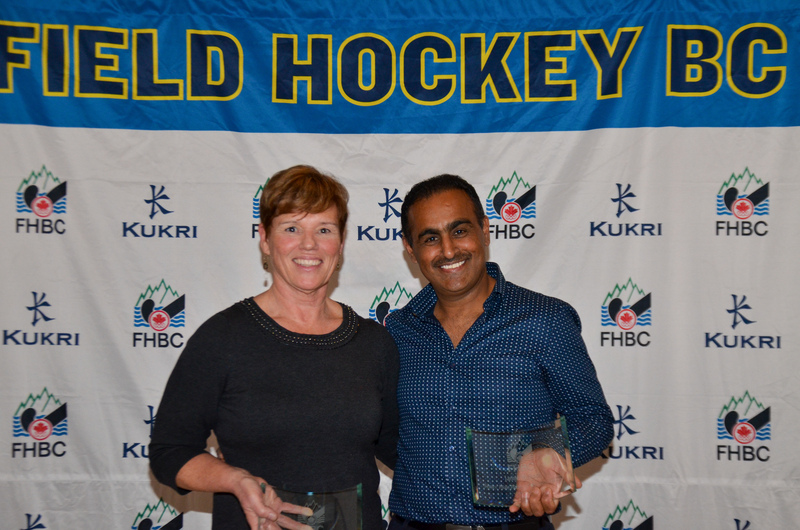 With Jamie away with the National Team at the FIH World Cup and Audrey at school in the States, these awards were accepted on their behalf by Field Hockey BC’s Coaching Director, Gurjit Sidhu and Domestic Director, Brenda Rushton. Nora Goddard-Despot, 2018 Junior Female U18 Athlete of the Year. The Junior Under 18 Female Player of the Year award was presented to Nora Goddard-Despot for 2018. The summer of 2018 was a busy one for Nora. She was first chosen to represent Team BC at National Championships, then chosen to attend the National Junior Development Squad summer training series, and finally selected to travel to Belgium as part of an Under 23 squad which participated in a 6-team tournament. Nora is a great example of someone who is truly dedicated to the hard work and the willingness to be tested outside of your comfort zone that is required to be a high-performance athlete. She is a young woman of great character who possesses a first-class attitude and it is a pleasure to see her journey grow as a field hockey athlete. The future certainly looks bright. It is our pleasure to award the Under 18 Female Player of the Year award to Nora Goddard-Despot. Naman Sharma, 2018 Junior Male U18 Athlete of the Year. The Junior Under 18 Male Player of the Year award is presented to Naman Sharma for 2018. Naman showed continued improvement over the length of the program and performed at the highest level as a striker demonstrating sensational finishing skills. Game awareness is a difficult skill to teach and the coaches were especially impressed in Naman’s ability to consistently find the right outlet pass and spread team play. Naman is an exciting player to watch and we are confident that his commitment combined with an improving skill set will take him a long way in the future. It is our pleasure to present the Under 18 Male Player of the Year award to Naman Sharma. 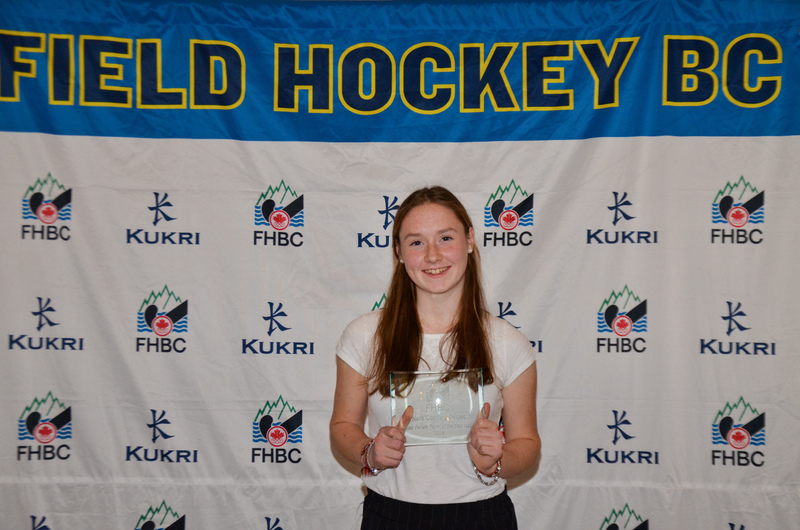 Tessa Everett, 2018 Junior Female U15 Athlete of the Year. The Junior Under 15 Female Player of the Year award is presented to Tessa Everett for 2018. Tessa has shown herself to be a focused, determined athlete with a drive for excellence. She is an impact player every time she steps over the line whether it is in training or a game and helps raise the standard of play of all those playing around her. Tessa is a true holistic athlete, a strong leader and holds herself to the highest character and accountability. She is a great example of what a provincial athlete should be and is wholly deserving of the player of the year award. It is our pleasure to award the Under 15 Female Player of the Year award to Tessa Everett. Jagjot Hayer (left), 2018 Junior Male U15 Athlete of the Year. It was a pleasure to coach Jagjot this past year. He is a strong competitor who was able to step into a leadership role for his provincial team. At the beginning of the year, we challenged him to not only be his best at each training session and match, but to also make the players around him better. He took that challenge head on and improved his game, and his teammates, each time he stepped on the field. The future certainly looks bright and we all look forward to witnessing Jagjot’s continued growth in the future. 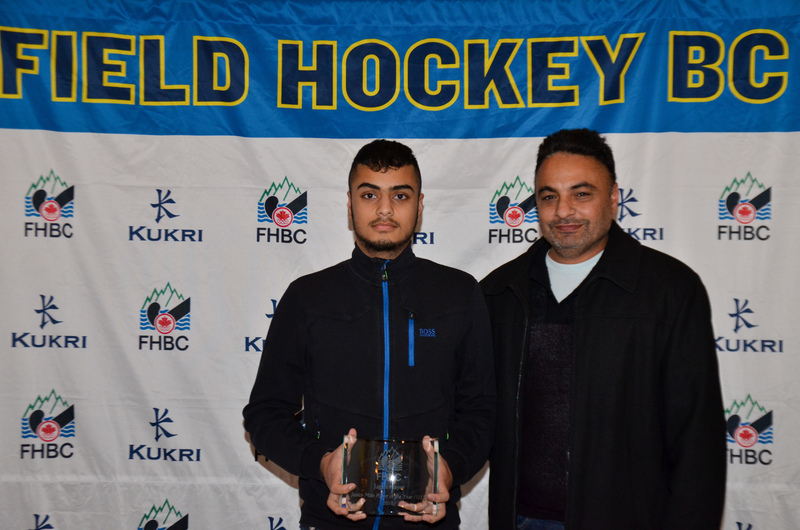 It is our pleasure to award the Under 15 Male Player of the Year award to Jagjot Hayer. Denise McGeachy, 2018 Barbara Schrodt Award Winner. 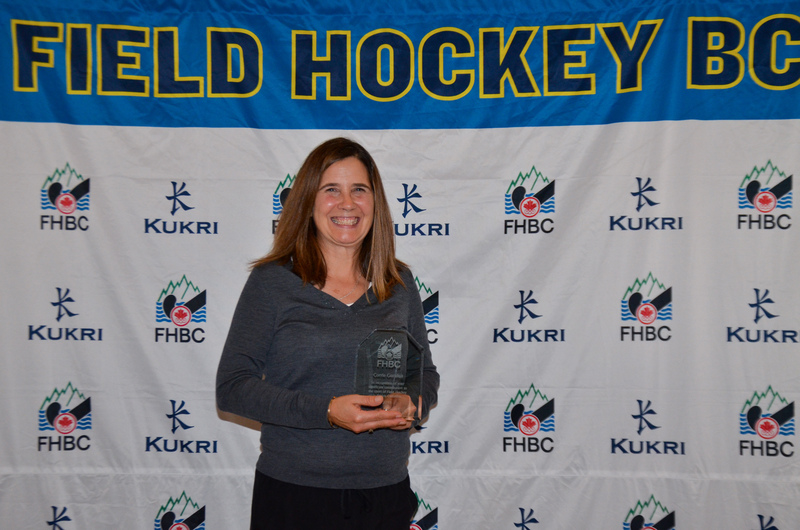 The Barbara Schrodt Award is presented to Denise McGeachy for 2018 and is an award presented to “someone who has made a difference to women’s field hockey in BC”. 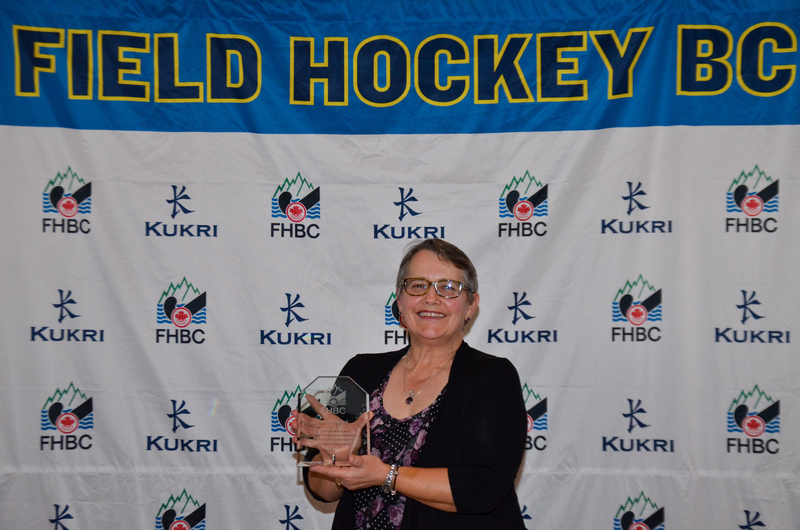 Denise has been a leading advocate for field hockey across Canada for over twenty years. Denise has served as an Executive Member with the Vancouver Island Ladies Field Hockey Association, with the Victoria Junior Field Hockey Association, and was instrumental in the vision to create the umbrella Society Field Hockey Victoria. Not only did Denise drive the vision for Field Hockey Victoria, she also agreed to serve as President and continues to this day as an executive member. But Denise’s impact is not only highlighted in areas of governance and leadership but also in her passion for field hockey officiating. Denise has been a long serving member of the Vancouver Island Umpires Association, has served on numerous National and Provincial Umpiring Committees, and continues to give back as an officiating learning facilitator and as an umpire assessor and mentor. For a great many years, Denise was seemingly ever present at local, regional, provincial, national, and international events as both an umpire and as a passionate field hockey volunteer. 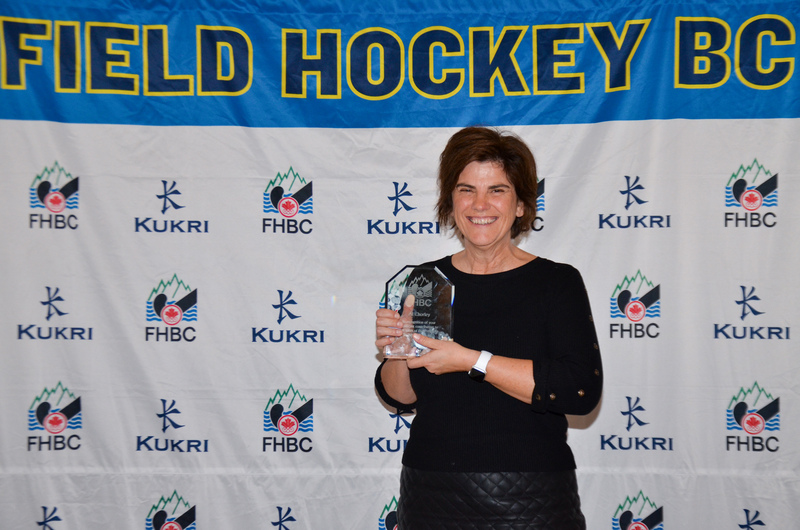 Denise continues to give back in so many ways and it is Field Hockey BC’s pleasure to recognise such commitment in presenting Denise with the 2018 Barbara Schrodt Award. 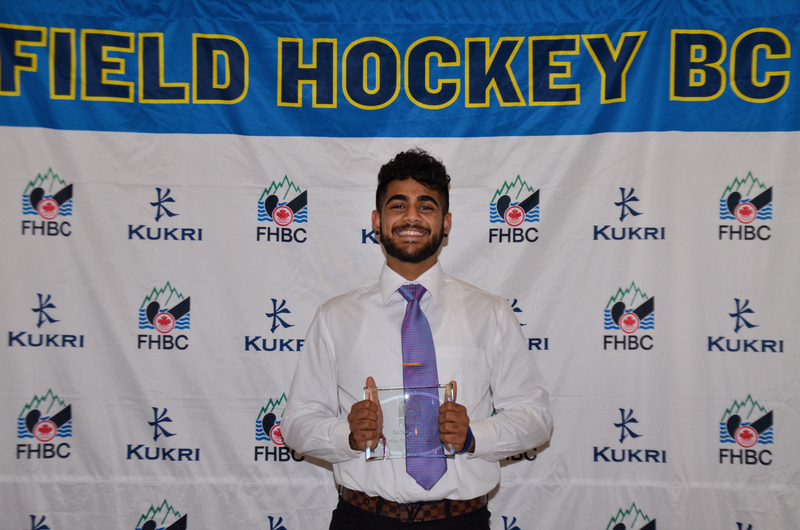 Udham Hundal, 2018 Contribution to Men’s Field Hockey Award Winner. The Contribution to Men’s Field Hockey Award is presented to Udham Hundal for 2018. Udham Hundal has made a tremendous impact on sport and cultural activities for adults and children alike. With his dedication he has enriched the lives of many generations especially youth by serving as a role model, and mentor within all aspects of club field hockey. Udham has been instrumental in building field hockey in his local community and has been the leading light in realizing a vision to create an annual international field hockey celebration that not only provides a sporting experience but also celebrates the positive impact sport has within the community. Such a vision was first realized in 2008 and has now developed from a predominantly male targeted event to include male and female participation at all levels. The International Canada Cup Field Hockey Tournament celebrated its tenth anniversary this year and Udham has been ever present at the helm of what is considered one of the most significant events in the Canadian calendar. 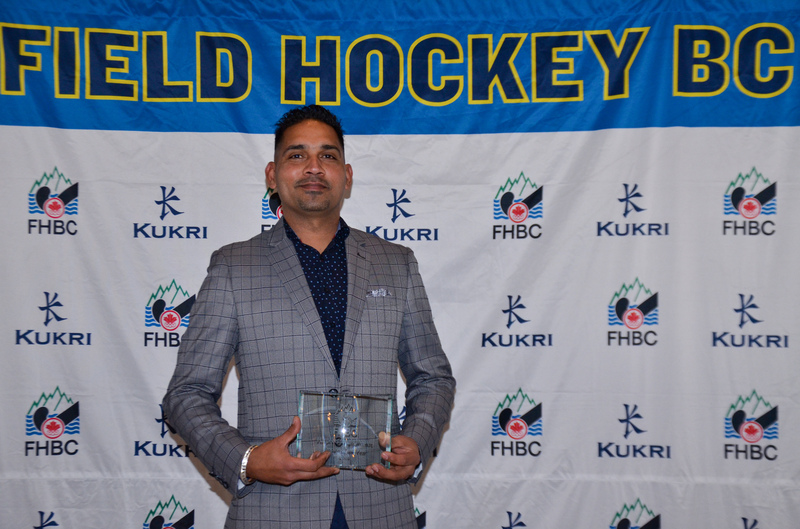 Working tirelessly behind the scenes and doing so in such a humble manner, Udham is the first to offer his assistance to further opportunities in field hockey and has been of great assistance to both Field Hockey BC and Field Hockey Canada over a great many years. We are pleased to present the 2018 Contribution to Men’s Field Hockey Award to Udham Hundal. Ben Fecht, 2018 Coach of the Year. The Coach of the Year Award is presented to Ben Fecht for 2018. Ben has been a Head Coach for the Interior Regional Athlete Program since 2014. The 2018-19 season marks Ben’s fifth consecutive year coaching with Field Hockey BC across multiple levels. With his strong connections to the Interior field hockey community, Ben has shown consistent leadership for our Interior programs and has been an essential resource to athletes and parents alike. Ben has committed each year to travelling to Regional and BC Tournaments in support of Interior teams and individual Interior athletes and continues to do an excellent job coordinating all logistics with parents and with Field Hockey BC. 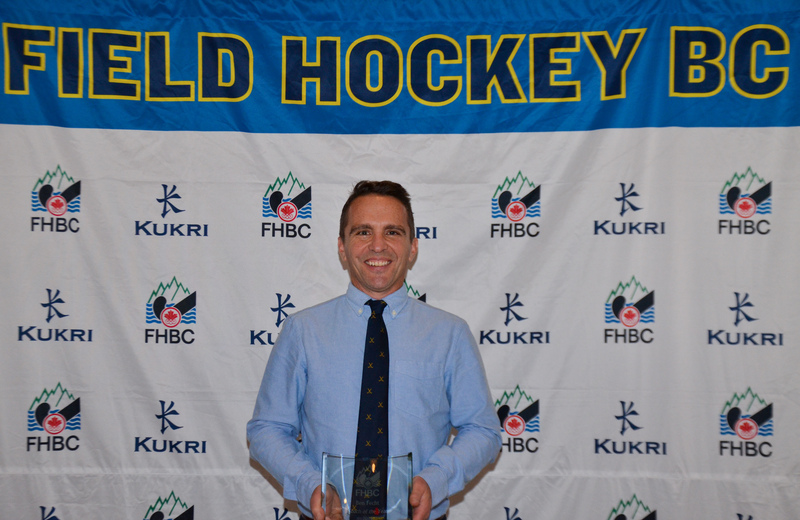 Ben remains a key contact between Field Hockey BC and our Okanagan community and we are extremely grateful for all he does on behalf of the region. In recognition of his leadership and ongoing contribution, it is my pleasure to present the 2018 Coach of the Year Award to Ben Fecht. Harpreet Jhamat, 2018 Umpire of the Year. The Umpire of the Year Award is presented to Harpreet Singh Jhamat for 2018. Harpreet has seemingly been ever present at Field Hockey BC, Community Club and League, and Field Hockey Canada events throughout the year. Whether it is a junior or senior event, Harpreet’s name is often the first to appear on an officiating roster. Always professional and always conscious of the need to assist developing umpires, Harpreet is an invaluable asset to field hockey in BC and beyond. 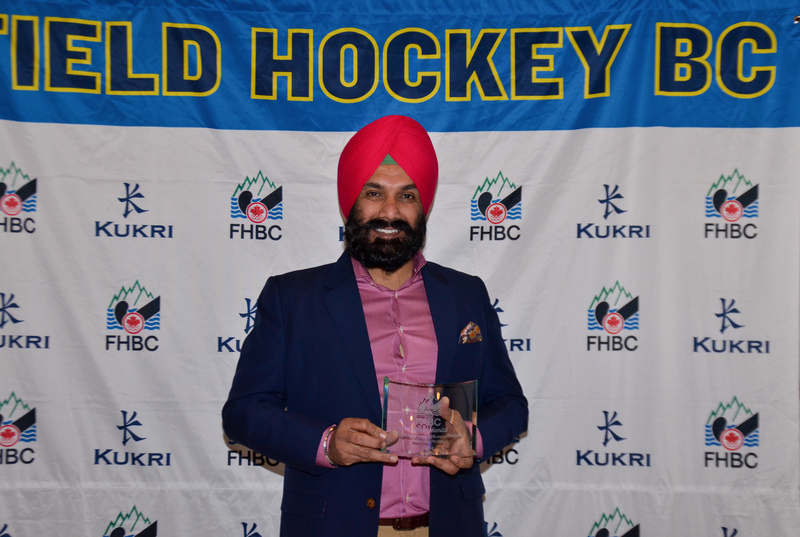 Over the last twelve months Harpreet has officiated at the Field Hockey BC high performance events, the club championships, the VIT, BC Club Invitational events, the Junior National Championships and of course is active within the male and female junior and senior leagues in BC. Our thanks and congratulations go to Harpreet for his ongoing contribution and it is our pleasure to recognise this contribution in naming Harpreet as the 2018 Umpire of the Year. 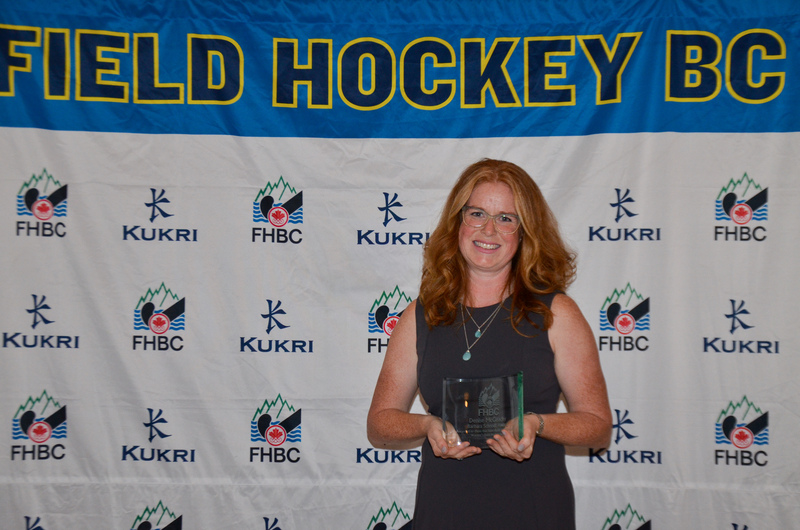 This awards event, currently in its eleventh year, was designed to provide Field Hockey BC with the opportunity to recognise members of our community who have contributed endless hours of time and energy to assist the Society in delivering extended opportunities to those involved with field hockey in BC. We hope that the following voluntary recognition awards go some way to expressing our gratitude for the difference you make to our sport. A volunteer is defined as “a person who freely offers to undertake a task”. Our field hockey community has a great many volunteers and tonight we again recognise those that have played a role in assisting our sport at a provincial, regional, and local level. Field Hockey BC hopes that the following voluntary recognition awards go some way to expressing our gratitude for the difference you make to our sport. Corrie has been volunteering her time within Field Hockey BC programming for a great many years, not just in the area of team management but also as a voluntary technical official. In many cases Corrie seemingly finds the extra time in her schedule to assist us in both capacities at the same event, something for which we remain truly grateful. In 2018 Corrie was an extraordinary resource to Field Hockey BC, not only in the management of teams but also in the management of individual athletes who required assistance in navigating both Field Hockey BC and Field Hockey Canada commitments. Corrie agreed to take on a team management role with Team BC at this years National Championships in Toronto, volunteering to stay on and chaperone athletes in the lead into the National program camp that followed, and in doing so created a safe and enjoyable environment that gave BC parents assurance as to their child’s safety and well-being. It is Field Hockey BC’s pleasure to present a 2018 voluntary recognition award to Corrie Guraliuk. Over the course of the last three seasons, Roger Goodwin has volunteered to take on the considerable task of athlete program management and has done so at both the regional and provincial level. Roger has an extraordinary attention to detail and will not rest until the job has been completed in its entirety – Even if this means tracking down uniforms from different pockets of the province and returning them to us in good order! In 2018, Roger was an absolute stand-out candidate not only managing his own team but also assisting other voluntary managers, especially at this years National Championships in Toronto, Ontario. Roger is a fantastic resource, a dedicated team-player with an approachable demeanor, and has an ‘anything is possible’ attitude. It is Field Hockey BC’s pleasure to present a 2018 voluntary recognition award to Roger Goodwin. 2018 saw Sue Demuynck step down as Field Hockey BC President after the maximum allowable three terms and six years in office. Many of us would be correct in thinking that following six years of voluntary service as President to a Provincial Sports Organization, one could enter voluntary retirement with a sense of great satisfaction. 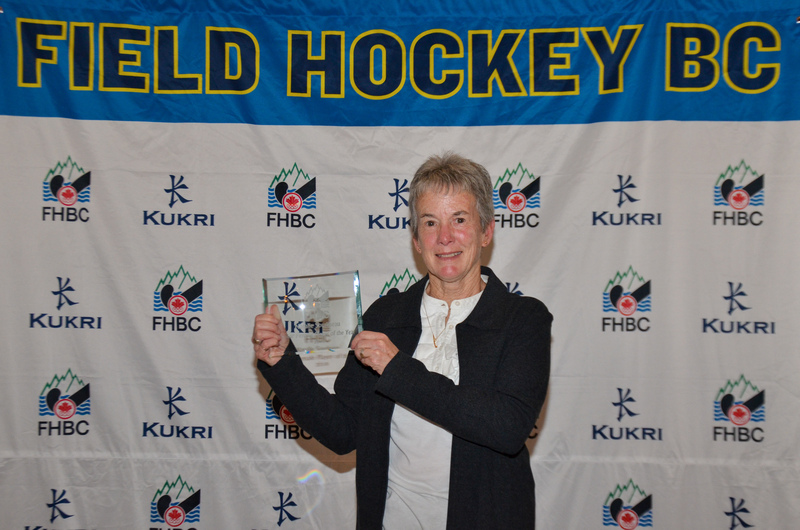 And whilst such satisfaction is truly deserved, Sue’s last voluntary governance role as President of Field Hockey BC reflects only a mere fraction of a far more significant contribution to field hockey in BC. Sue has in fact been an integral member of the field hockey governance family for over forty years. Since joining the BC Women’s Field Hockey Federation Executive in 1974, Sue has been ever present holding a multitude of roles right up until the BC Women’s Field Hockey Federation amalgamated with the BC Men’s Field Hockey Association to become Field Hockey BC in 2005. And upon amalgamation, what did Sue do…she immediately volunteered to lead the strategic direction of the Women’s High-Performance athlete portfolio, then proceeded to add the Men’s High-Performance Portfolio to her responsibilities, before taking on the role of Vice-President and then President to the Field Hockey BC Board of Directors. Sue has been integral in helping to shape and guide field hockey development in BC over a period of 44 years and whilst she may have stepped down in a direct governance capacity, Sue is still passionate about continuing her role as a technical official and within this in the mentorship of new and existing volunteers active in the support of event and competitive hosting.For her dedication to Field Hockey BC and her seemingly endless support for field hockey across Canada, it is our pleasure to present a voluntary contribution award to Sue Demuynck. Field Hockey BC was extremely fortunate in 2008 to have Eric Broom volunteer to take on the role of Coaching Director to the Field Hockey BC Board of Directors, a role he continued in for close to a decade. A legend in the Canadian Coach Education system, Eric continued to bring his vast knowledge and experience to the fore in driving the quality of coach educational delivery in BC, and in helping coaches to shape the athlete program environment we see today. A master learning facilitator for all things NCCP, Eric continues to deliver formal coach education to all levels of our sport and we are delighted that Eric has recently agreed to be a principal resource in the delivery of coaching ethics, safety, and long-term athlete development as Field Hockey BC prepares to launch a new community coach education pathway in 2019. 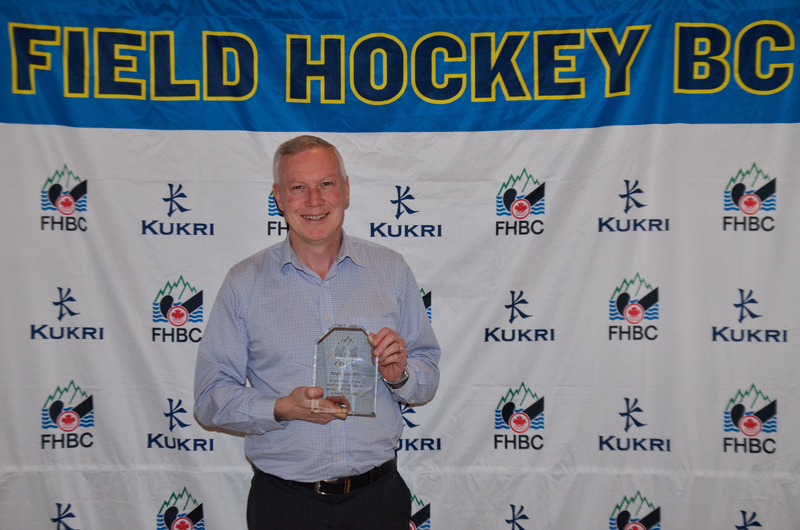 It has been an absolute pleasure to have served with Eric on the Field Hockey BC Board of Directors and it is our pleasure to recognize Eric’s significant voluntary contribution to our sport with the presentation of a 2018 voluntary contribution award. 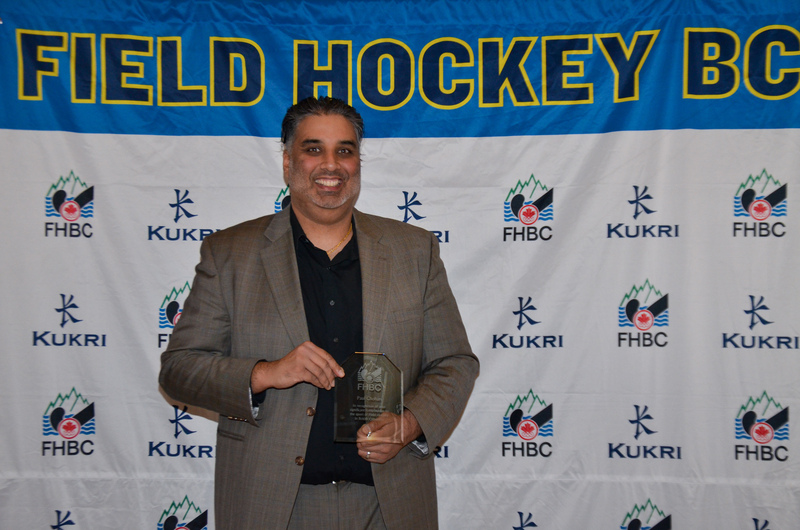 Paul Chohan has been a long-serving executive member at both a club and provincial level with Field Hockey BC and continues to serve as a valuable resource when considering the development of field hockey at all levels. Paul first volunteered to serve on the Field Hockey BC Board of Directors in 2008 in the capacity of Umpiring Director and served two terms before volunteering to take on the Business Development Portfolio. During his time as a Field Hockey BC Board Member, Paul was instrumental in the development and execution of the Field Hockey BC umpire mentorship program and assisted in the development and launch of the Field Hockey BC Foundation, a charitable arm of Field Hockey BC’s service delivery which each year awards grants and bursaries to assist athletes, coaches, officials, and volunteers to further their opportunities within field hockey. For his dedication to Field Hockey BC and his continuing role at the community club level, it is our pleasure to present a voluntary contribution award to Paul Chohan. Karen Gray accepted the award on behalf of Al Chorley. Al Chorley has been a member of the Men’s Field Hockey Team for the last 6 years, encouraging other players and managing the D team specifically. When he is not playing on the turf, he is frequently cleaning it. He has put in hundreds of hours cleaning leaves and debris off of the field and the spectator areas, keeping the fields clean and safe. Most notably though, Al Chorley stepped up over the last 3 years to coach the men’s recreational teams and run the practices. This is in addition to volunteering to assist in coaching for the juniors in the Spring League. There is no way to easily measure the contribution that Al has made to the West Vancouver Field Hockey League, but his impact will be felt for generations. 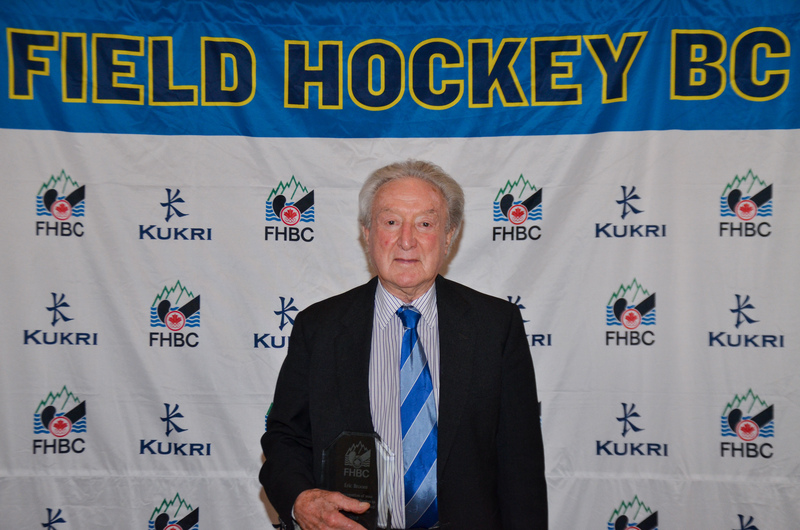 It is Field Hockey BC’s pleasure to present a community voluntary recognition award to Al Chorley. Accepting this award on behalf of Al was Field Hockey BC’s Business Development Director, Karen Gray. Sandy Zinkowski has long been a valuable member of the Victoria field hockey community both as a coach in junior league, a player in women’s league and as the go-to athletic therapist. Outside of her playing and coaching commitments, Sandy has volunteered her time either as an athletic therapist on site or has been the coordinator to assure qualified staff are at the field for Victoria-hosted tournaments including the Bridgman Cup and a variety of regional and provincial high school championships. Often times when Sandy is at the field, not in an official capacity as an athletic therapist, she has been called over to the field for injuries or treatment of a different game. She has never hesitated to give her time to help, even if it means missing part of her game. Sandy is a valuable member of the island field hockey committee both for her expertise as an athletic therapist but also for her years of commitment to the community as a volunteer, coach and player. 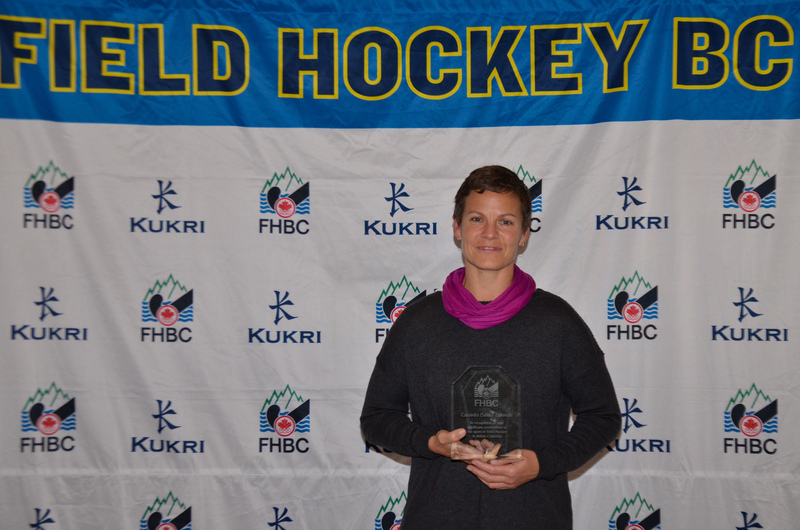 It is Field Hockey BC’s pleasure to present a community voluntary recognition award to Sandy Zinkowski. The Surrey Sharks Field Hockey Club would like to recognize Oscar D’ Mello for his incredible dedication to the club since 2006. In that time, he has served as President and on the executive. He has coached both Juniors Girls and Senior Women’s teams and Oscar was instrumental in creating the very popular 7-aside Sharks tournament which still occurs annually. He has represented and advocated for the club with the city and still provides turf representation. 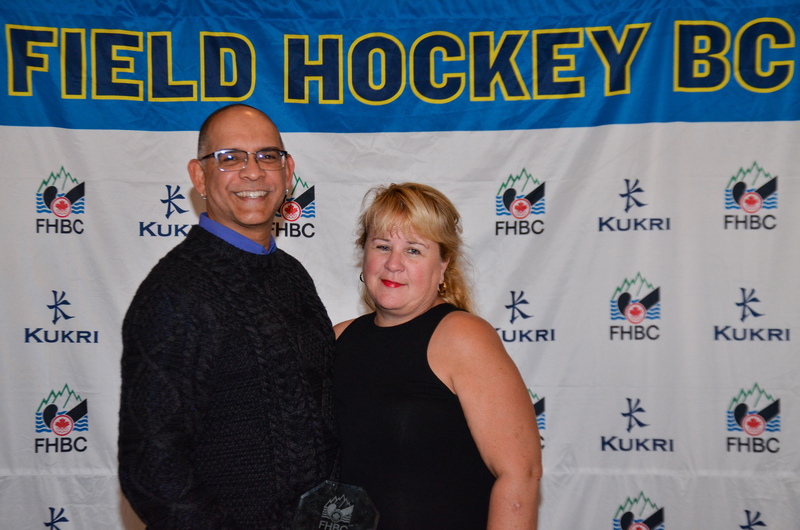 He continues to play and umpire for the club and we value his contributions.It is Field Hockey BC’s pleasure to present a community voluntary recognition award to Oscar D’Mello. Kathleen Wong (right) with Richmond FHC Board Member, Celina Fernandes. Kathleen is currently the voluntary President of Richmond Field Hockey Club, a role she stepped up to take on over six years ago. Kathleen has modernized the club in the development and utilization of a multitude of media platforms including a new club website. She has been instrumental in developing athlete opportunities at the club, continues to champion young women in sport, and has built strong connections at the Municipal level. The Richmond Field Hockey Club is extremely grateful to be given this opportunity to nominate Kathleen. 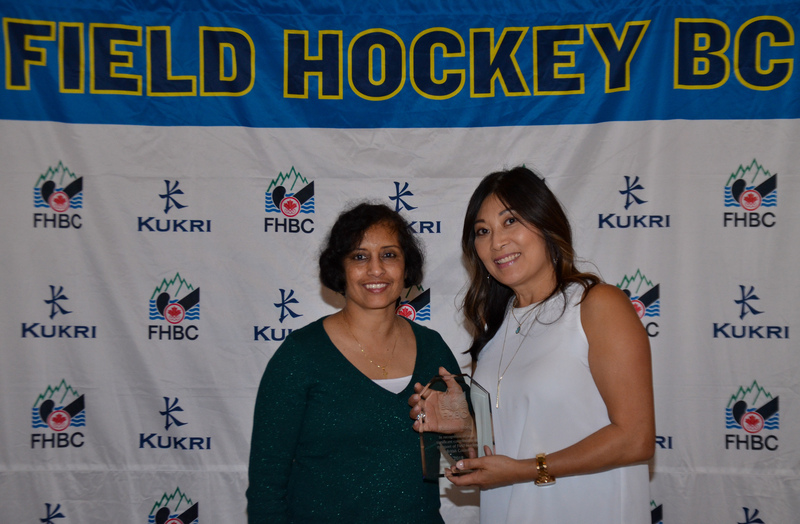 It is Field Hockey BC’s pleasure to present a community voluntary recognition award to Kathleen Wong.